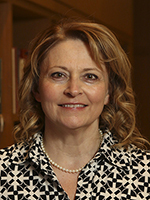 Emily Rodgers is a professor in the Department of Teaching and Learning. She is affiliated with the Reading and Literacy in Early and Middle Childhood Area of Study where she mentors graduate students, and teaches undergraduate and graduate courses related to early literacy. Rodgers studies educational policies and practices that influence the reading development of young students who are having difficulty learning to read and write; lines of inquiry that have their roots in her early career as a classroom teacher, a reading specialist and a special education teacher. Her research examines the nature of effective scaffolding in early literacy instruction, effective coaching of teachers, and challenges of reforming, implementing, scaling and sustaining effective literacy intervention practices. She was the co-investigator for the successful five-year $45 million scale-up grant to scale Reading Recovery in the U.S.; a grant awarded by the U.S. Department of Education’s Office of Innovation, and is currently the principal investigator for a $3 million i3 grant to develop an effective literacy instruction intervention called HEROES for students who have IEPs for beginning reading. What is the nature of effective scaffolding? What is the nature of effective professional development for teachers who work with beginning readers with reading difficulties? What can be done on a large scale to improve educational practices that affect beginning readers? The main goal of my professional activities has been to make a difference in the literacy lives of young children having great difficulty learning to read and write. Why is this important? For one, Juel (1988) showed with her longitudinal research that the children in her study who fell behind in first grade had about an 88% chance of still being behind in fourth grade, while average students had a 12 percent chance of struggling with reading later on. Through my research, publications, teaching, consultation, conference presentations, I have been working with teachers or literacy coaches (called teacher leaders) who all work directly with students, to make a difference to teaching and learning. D’Agostino, J. V., Rodgers, E., (2017). Literacy achievement trends at entry to first grade. Rodgers, E.M. (2016). Scaling and sustaining an intervention: The case of Reading Recovery. Journal of Education for Students Placed at Risk, 21, 10-28. Hough , H., Kerbow, D., Bryk, A., Pinnell, G., Rodgers, E., Dexter, E., Hung, C., Scharer, P., Fountas, & Fountas,I. (2012). Assessing teacher practice and development: The case of comprehensive literacy instruction. School Effectiveness and School Improvement, 23, 1-34. Briggs, C., Rodgers, E. & Simpson, A. (2011). A review of the U.S. text level assessment process. Journal of Reading Recovery, 10, 45---48. Rodgers, E. (2005). Interactions that scaffold reading performance. Journal of Literacy Research, 36, 501---532. Rodgers, E., Gómez---Bellengé, F. X. (2003). Closing the achievement gap in Ohio with Reading Recovery. Journal of Reading Recovery, 3(1), 65---74. Rodgers, E., Fullerton, S. & DeFord, D. (2001). What does it take to reform instructional practices? In J.V. Hoffman, D.L. Schallert, C.M. Fairbanks, J. Worthy & B. Maloch (Eds. ), Fiftieth yearbook of the National Reading Conference (pp. 519 – 531). Chicago, IL: National Reading Conference. Rodgers, E. (2000). Collaborative Inquiry in Reading Recovery, or "Why Sit in a Circle?" Rodgers, E., (2000). Language Matters: When is a scaffold really a scaffold? In T. Shanahan & F. Rodriguez---Brown (Eds. ), Forty---ninth yearbook of the National Reading Conference, (pp.78---90). Chicago, IL: National Reading Conference. Rodgers, E. & D’Agostino, J. (2012). Scaling up Reading Recovery: Two years of remarkable outcomes. Journal of Reading Recovery, 12 (2), 37-40. Rodgers, E. & D’Agostino, J. (2012). Funds to support scale-up of Descubriendo la lectura. Journal of Reading Recovery, 12 (1), 39---42. Rodgers, E. & D’Agostino, J. (2011). Scaling up Reading Recovery: Poised to start year 2. Journal of Reading Recovery, 11, 39---42. Rodgers, A. & Rodgers, E. (2007). The Effective Literacy Coach. NY: Teachers College Press. K---4 Classrooms. Portsmouth, NH: Heinemann. W. Verlaan (Eds. ), Literacy Research, Practice, and Evaluation (Volume 7): Writing Instruction to Support Literacy Success. Emerald Press. Rodgers, A., & Rodgers, E. (2013). Effective literacy coaching for teachers: Context and practice. In D. Strickland, D. Quatroche, & S. Wepner (Eds. ), The administration and supervision of reading programs. (5th Ed). New York: Teachers College Press. Rodgers, E. (2012). Using systematic observation to assess early literacy development and plan instruction. In E. Ortlieb and E. Cheek, (Eds). Literacy research, practice and evaluation; Vol 1, Emerald Press. Rodgers, E., Pinnell, G. & McGee L. (2010). Reading Recovery. In Thomas Hunt, James Carper, Thomas Lasley, Daniel Raisch, C. (Eds). Encyclopedia of Educational Reform and Dissent. Sage: Thousand Oaks, CA. G.S. Pinnell and P. Scharer (Eds). Guiding K---3 writers to independence: The new essentials. (pp.193---208). Scholastic. Rodgers, A. & Rodgers, E. (2007). Preparing for diversity: Professional development for today's teachers. In M. Schulz & B. Honchell (Eds.). Literacy for diverse learners. Christopher Gordon. Pinnell, G.S. & Rodgers, E.M. (2004). Reflective inquiry as a tool for professional development. In D. Strickland & M. Kamil (Eds). Improving reading achievement through professional development (pp169---193). Christopher--- Gordon Publishers. E. Rodgers (Eds.) Strategies for scaffolding literacy Instruction in K---4 classrooms. (pp. 1---10). Portsmouth, NH: Heinemann. Rodgers, E. (2002). Lessons from a successful reform initiative. In E. Rodgers & G. Pinnell (Eds.). Learning from teaching in literacy education: New perspectives on professional development. (pp.158---172). Portsmouth, NH: Heinemann. Rodgers, E., Fullerton, S. & DeFord, D. (2002). Making a difference with professional development. In E. Rodgers & G. Pinnell (Eds.). Learning from teaching in literacy education: New perspectives on professional development. (pp.52---62). Portsmouth, NH: Heinemann. Rodgers, E. M.& Pinnell, G. (2002). Professional development scenarios: What is and might be. In E. Rodgers & G. Pinnell (Eds.) Learning from teaching in literacy education: New perspectives on professional development. (pp.1---8). Portsmouth, NH: Heinemann. Rodgers, E. & Bwire, D. (2015). Reading Recovery in Ohio: 2009–2014 State Report. Rodgers, E. (2009). Reading Recovery in Ohio. 2007---2008 State Report. Columbus, OH: National Data Evaluation Center. Rodgers, E.M. (2008). Reading Recovery in Ohio: Executive Summary, 2007---2008. Columbus: The Ohio State University. Rodgers, E. (2008). Reading Recovery in Ohio. 2006---2007 State Report. Columbus, OH: National Data Evaluation Center. Rodgers, E. & Brymer---Bashore, J. (2008). Reading Recovery and Descubriendo la Lectura National Report, 2006 ---2007. Columbus, OH: National Data Evaluation Center. Rodgers, E.M. (2007). Reading Recovery in Ohio: Executive Summary, 2006---2007. Rodgers, E. & Gómez---Bellengé, F. X. (2006). Reading Recovery in Ohio. 2005---2006 Final Project Report. Columbus, OH: National Data Evaluation Center. Gómez---Bellengé, F. X., Rodgers, E. (2006). Reading Recovery and Descubriendo la Lectura National Report, 2004 ---2005. Columbus, OH: National Data Evaluation Center. Project Report. Columbus, OH: National Data Evaluation Center. Gómez---Bellengé, F. X., Rodgers, E. & Schulz, M. (2005). Reading Recovery and Descubriendo la Lectura National Report, 2003 ---2004. Columbus, OH: National Data Evaluation Center. Rodgers, E., Gómez---Bellengé, F. X. & Schulz, M. (2005). Reading Recovery in Ohio: 2003---2004 State Report. Columbus, OH: National Data Evaluation Center. Gómez---Bellengé, F. X., Rodgers, E., (2004). Reading Recovery and Descubriendo la Lectura National Report, 2002 ---2003. Columbus, OH: National Data Evaluation Center. Rodgers, E., Gómez---Bellengé, F. X. (2004). Reading Recovery in Ohio: 2002---2003 State Report. Columbus, OH: National Data Evaluation Center. Gómez---Bellengé, F. X., Rodgers, E., & Fullerton, S.K. (2003). Reading Recovery and Descubriendo la Lectura National Report, 2001 ---2002. Columbus, OH: National Data Evaluation Center. Rodgers, E., Gómez---Bellengé, F. X. & Fullerton, S.K. (2003). Reading Recovery in Ohio: 2001---2002 State Report. Columbus, OH: National Data Evaluation Center. Rodgers, E. (1998). Understanding Teacher and Student Talk During Literacy Instruction in a One---to---One Tutoring Setting. Unpublished doctoral dissertation. Columbus, OH: The Ohio State University.